No… this isn’t a store, this is my personal collection of yarn. As some of you may already know, I don’t refer to this as a yarn ‘stash’. This is my collection of yarn. I organize my yarn by brand and not colour. I prefer to quickly see if I have a colour within a brand then surfing through all of the same colours to see what brands are there. For me, that makes sense. I used to store my yarn in bins and totes but I stopped doing that. I am very fortunate to have the room in my home to store my yarn in this way. The shelving you see is from Ikea. Each shelf can hold 16 balls of normal 7oz size yarn balls as found as Walmart for Super Saver. It can hold a lot of yarn per section cube. The pricing of the shelving is only $70 each. Each shelf has 8 cube sections. It can hold 128 balls each. That’s a lot of yarn. When you factor in the pricing of a tote and the inconvenient nature of stacking totes and trying to find the yarn you need, this system seems more cost effective and convenient. Yarn needs to to breathe. If you trap your yarn into totes which little air movement and within the combined nature of humidity, your yarn can go musky and really smell terrible. You really can’t wash your yarn before you use it. You most likely will trash the yarn. Seems like a huge waste. The downside to storing your yarn like my system is if your basement or living space is damp. It will absorb the dampness, smells or anything pertaining to your home. If you are a smoker, your yarn will absorb the smoke. Some people like to complain about their yarn getting dusty if the yarn is exposed like this. I just dust it off and it’s really no big deal for me. For any balls that I use a portion of a ball, I put the remainder of my ball through a ball winder to condense the packaging to make it easier to store. I keep the labels and insert them into the centre of the new ball formed by the ball winder so I know the exact colour and brand. Is there such thing as too much yarn? I hate to admit it but there is. Many people collect yarn just because but really will never use it in their lifetime! I probably will never use all of my yarn but I do giveaways and gift my yarn on occasion to where I think another crocheter or knitter would like some of my collection. For me, I came to the realization in 2011 that yarn is my hobby, plus also my business. It’s a part of my everyday life. I made more of a mess when I was rifling through totes than this new system. My biggest problem is when I get more yarn that i don’t usually put it away. Truth is too, some of the yarn I liked it in the moment of purchase but have changed my mind over time. In those cases, I should just get rid of it to someone that might enjoy it better than I. If yarn brings you happiness and this is your hobby, why not display your yarn like a library collection. Sure, maybe some men or family members won’t see your idea of storage as pretty, but if it makes you happy… then too bad for them! haha… That’s my motto anyway. 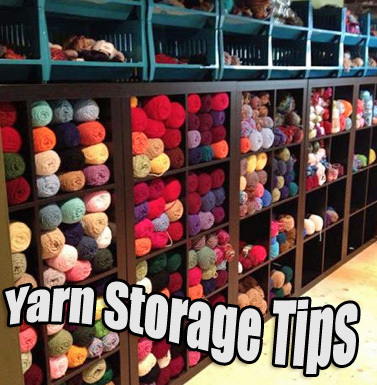 This entry was posted in Advice & Tips and tagged crochet crowd, How to Store Yarn, ideas, Mikey, Store, Storing, Super Saver, Tips, Walmart, Yarn, Yarn Storage. Bookmark the permalink. Hi Mikey, I love your storage method. I too have a collection of yarn and I organize it by brand and weight. I currently have 460 skeins of yarn. It is stored in 64 and 128 gallon totes in my walk-in closet. I also inventory my yarn so that I know what I have. I have purchased yarn in the past only to get home and realize I already have the same yarn. I inventory at least twice a year and recently sent a box of yarn that I knew I was not going to use (buyers remorse), hooks and a yarn drum tote to South Africa for my nieces housekeeper. From what I understand yarn is very pricey there. I have another box ready to ship this weekend. I love your idea of storing by brand, not color. I’ve always done it by color but thinking logically about it, it makes sense to do it by brand. I like working on a project with all of the same brand yarn. Each brand have their differences and it can really show up in a project when mixing and matching. Love your yarn room, Mikey. Please adopt me! Wow, I wish I had a room like this. I store mine by type in Space Bags or plastic storage containers. I separate by wool, acrylic, baby, cotton-worsted weight, cotton – fine weight, and specialty. I cannot walk in my walk-in closet without moving yarn. I store my yarn by colour. Not thought about storing in brand. I need a re-think and a junk out. I have a challenge on at the moment not to buy any more yarn without meeting the following criteria to buy one ball of yarn I need to use up minimum of 10 balls of yarn that is already being stored. I am an impulsive buyer and tend to buy without a purpose, convincing mysef I will use the yarn for many, many projects. I just kid myself….. So far I am hit and miss with my challenge but I am getting better; as I am using as much of my old stock yarn for charity projects or various online challenges in an attempt to reduce. This is a great idea. I actually have 2 of the shelving from Ikea except in red. Was hoping to use to store excess kitchenware. Can’t wait to use it for my yarn now. Just wish I had a collection like yours. I have access to lots of boxes from the recycling center where I work. I turn them open side out and stack them in rows and columns like you re shelving. Saves from spending money on shelfs and I can buy more yarn. Thanks so much for the tip Mikey!!! I am using totes at the moment and didn’t realize there could be a problem. I do know the hassle of having to shift the totes to find/get what I’m looking for. LOVE your system!! I have a 24/7 webcam feed from my home office/craftroom on my webpage to help promote my work, and I use my yarn as part of my backdrop. Folks who view it are delighted by the rainbow of colors displayed on my top shelf. (Since I mostly only have redheart yarn, it makes sense to sort by color, with exceptional skeins and balls of yarn set aside for easier access.) It also just makes me happy to walk into my office and have yarn all around me, to know that whatever project I decide to attempt, I have the necessary materials to make it happen. I also share my yarn if I have someone in my life who could make better use of it than me, but I am often repaid in kind by another skein in a color I don’t have yet, so it balances out. If it makes you happy….It can’t be that bad, as the song says! Totally Agree. IKEA also sells shelves, with glass doors on them. Great for storing yarn, dust free. I should have said(you have organize ). Sorry, I left out (you). I just filled a bag for Goodwill today. I hope someone makes good use out of it. maybe you can set up clear shower curtains to keep the stink out and still see what you have. This is so cool. I don’t have the room right now….maybe when the rest of the flock flies the coop, though. I have cats as well….they would see rows upon rows of nap attack stock, and a bit of play time I suspect. Looks like Expidit shelving. Various sizes to choose from, and you can get drawer inserts and the like for notions and patterns, etc. I just came from ikea and bought a large bookcase to shelf all my yarn. Turns out I had more yarn and afghan kits than I thought. Not sure if I will ever finish. But now that I see what I own it makes it easier for me to pick a project to work on. Instead of spending more money on yarn. I had my tubs numbered, and kept inventory on my computer on an excel spreadsheet. I like this much better. I can still keep my spreadsheet, but display my yarn. The best of both worlds! I would love to start an inventory of mine. Can you post a copy of the spreadsheet or email me a copy as I am not sure how to go about starting one? It was in response to Audrey above who said hers is in tubs and numbered. I have so much sometimes I buy what I already have. What is the Ikea name and number of the units you used. I want to go in and check out them out. I have an Ikea unit also, I worry about moths in my wool so it is in cloth covered boxes from Ikea also. I am re-doing mine today also. Fun but messy until done. Looks like a dream come true for me. Walmart also carries cubes that are stackable and have a door for anyone who might be concerned with dust. I have four dogs so having something like this in a space far away from then would save my creations. I have my yarn in totes. Keeps it safe from mice and other critters that happen to get into my basement.. I love your space..
Love your idea. I store mine in totes for right now by brand first. I would love to be able to have a room solely devoted to my craft. Maybe when all my kids move out..
For those concerned of “dust” collecting on their yarns, set up sheer fabric curtains over the shelves. The curtains will bock the dust circulating in the air from reaching your previous yarn, and the sheerness allows for easy sighting of a particular color. I just put plastic square baskets up on my wall last weekend and pulled all my yarn collection out of totes to store it better. I love the look. It’s like art on the wall but functional as well. I have a lot of yarn but I also co chair a prayer shawl group for our church so we use a lot of yarn making prayer shawls and lapghans. I end up giving some of mine away as well to other members of the group that need it. But my crochet is my life. I wish my husband would let me do that. Maybe when we get a bigger house! I use some of your ideas like winding the remainder of a ball, etc. I don’t have as much yarn as you do, but I have a double garage that’s air conditioned full of yarn and paraphernalia. I belong to a group that meets every week and we bring yarn we don’t need or want and give it (or swap it). Whatever is left after everybody takes what they need is donated to local charities. I have a 1- bedroom Condominium. Though it is large, space is limited. I do have a personal storage room in the Basement. My Yarn is stored in those Space Bags. I would love to display my yarn like yours in my storge room, but, possibility of flooding, and spiders, ( hate them ) has me shaking my head.Thanks for sharing your Yarn Collection. I absolutely LOVE this. And I really needed to hear this. I agree. And it is time that I turn my home into a space that makes me happy — not just a roof over my head! Thank you so much!